Engine rough idle problems arise because car engines are demanding. Components in the fuel, ignition, emission and other systems should work correctly. 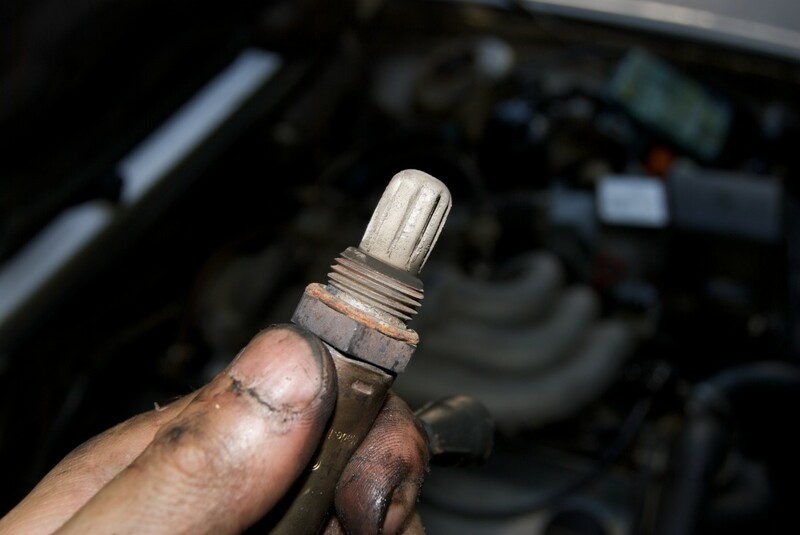 It only takes a minor problem like a fouled spark plug to cause your engine to vibrate. Idle problems may originate in a worn out component, a failed part, or a blown gasket. The number of potential sources of a rough idle can make your diagnostic a little difficult. Still, you have at your disposal several tools to help you troubleshoot and fix the problem sooner. Even more, on modern vehicles the car computer monitors many sensors and actuators and usually can detect small deviating operating parameters and store related trouble codes as necessary. The code may indicate the component, circuit or system involved in the fault. So this gives you an additional advantage. In this guide, you'll find many of the components that, when going bad, will usually cause engine rough idle problems. The components are ordered from the most frequent to the least, either because they usually receive little attention or because they are bound to fail within a number of miles of operation. To make the most out of this list, pay attention to the 'Other symptoms' at the bottom of each component description. And compare these symptoms and conditions to the ones you've noticed in your car. This will help you zero in on your diagnostic faster. For example, when your engine idles rough, you may notice the problem only shows up before the engine warms up; then idle smooths out. This may indicate a bad ECT sensor as described in Other symptoms in that section. So pay attention to all the symptoms and conditions when given in each component listed to make your diagnostic easier. Do You Have a Driveability Problem? Before starting hunting for the source of a rough idle, you can do this simple method to confirm that you have a driveability problem. It'll work in most cases. 1. Set your transmission to Park (automatic) or Neutral (manual), and apply the parking brake. Start the engine and let it idle. 2. Now, listen to the sound coming out of the tail pipe. If you hear a clear popping sound, most likely you have a performance problem; if not, check the engine mounts. A worn out, loose or damaged engine mount can cause the engine to vibrate. A faulty spark plug may cause several engine performance problems, including an engine rough idle. The same conditions under which the spark plug operates, along with poor engine maintenance, may foul the tip with ash, oil, or carbon deposits. On top of this, miles of service cause the plug electrodes to wear out, widening the gap. This causes an increase in the voltage needed for the spark to jump between the electrodes; but this condition may burn the plug tip and other ignition components, resulting in a rough idle and possibly other engine performance problems. Remove the spark plug to inspect it. Check the condition of the plug tip. Look for signs of contamination like oil (which may indicate worn rings, a scored cylinder or leaking valves), ash (poor fuel or oil leak), carbon (weak ignition, rich mixture), damage (perhaps from preignition or use of a wrong plug for your model). Also, check the gap between the electrodes using a wire feeler gauge and regap the plugs. You can find the correct gap for your plugs in your car owner's manual or vehicle repair manual. If you don't have this manual, you can buy an inexpensive aftermarket manual online or with your local auto parts store. Your vehicle repair manual also has the service schedule for your spark plugs. 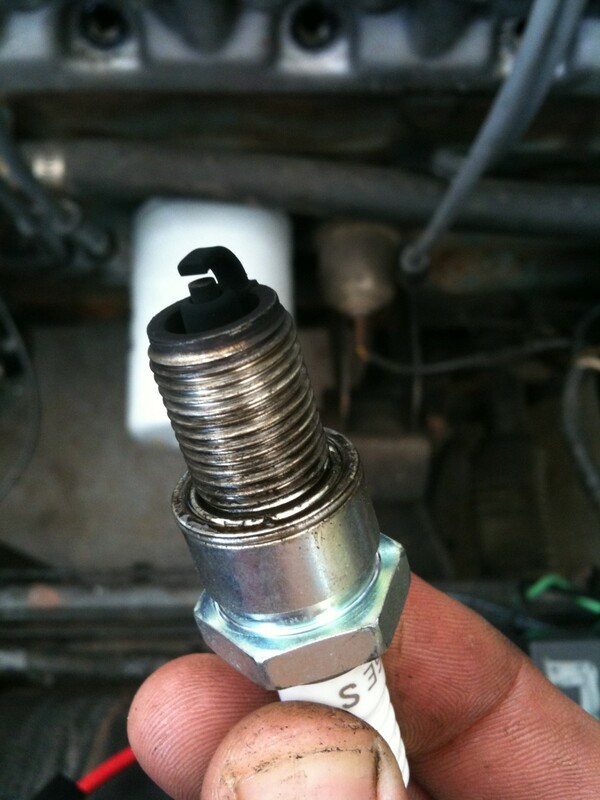 Spark plug wires represent another potential problem in the system. Check spark plug wires resistance using a digital multimeter, and replace them according to the maintenance schedule as described in your vehicle repair manual. Some manufacturers suggest replacing the spark plugs every 2 or 5 years or more, depending on the type of plugs your engine is using. Also, check other ignition components like rotor, distributor cap, and ignition coil(s) for wear or damage. Other symptoms: you may notice misfires, an increase in fuel consumption, loss of power and hard starting. The air filter traps dirt, dust particles and other matter out of the air going into the intake manifold. Most filters use paper as the filter element and after a few months of work, the elements clogs, reducing air flow rate. 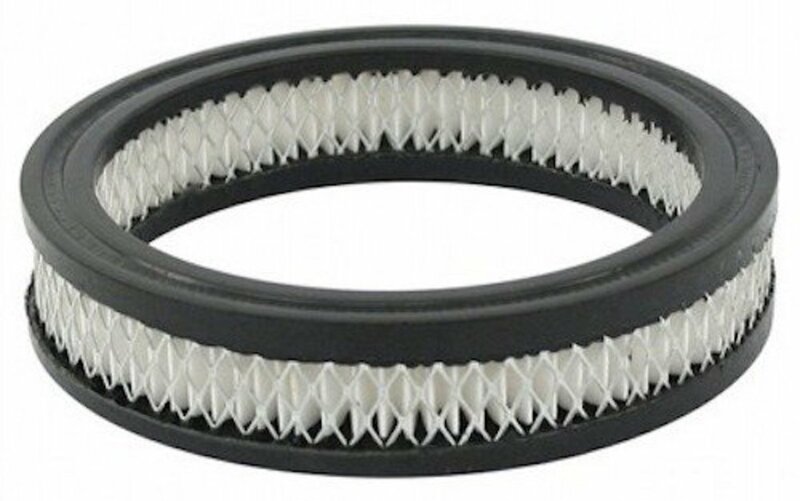 If you haven't changed the filter in more than two years, you'll notice a rough idle. Most car manufacturers suggest replacing the air filter every year. Check your vehicle repair manual or car owner's manual. When installing a new filter, thoroughly clean the filter housing. Carefully close the air box and properly re-attach any ducts you had to disconnect to prevent unmetered and unfiltered air into the intake manifold; otherwise you'll cause more drivability problems. Other symptoms: A clogged air filter may also cause an increase in fuel consumption, stalling, in extreme cases, and other drivability problems. The exhaust gas recirculation (EGR) valve allows a certain amount of exhaust gases into the intake manifold to help lower engine temperature and harmful emissions. When the valve fails, it may get stuck close or open, or even leak. It is when the valve remains open when engine idle suffers. Sometimes, the engine may stall at idle because of the lean of the air-fuel mixture. It is possible for you to test the EGR valve at home, using a hand held vacuum pump. Other symptoms: An EGR stuck open may include a rough idle, rough performance at low engine speeds, stalling at idle, increase in fuel consumption, fuel odors, and possibly a check engine light on. The mass airflow (MAF) sensor can also cause a rough idle. This sensor measures the amount of air flowing into the engine using a sensing element. A dirty sensing element is the most common fault, but the sensor itself can develop other faults. On most cases, a malfunctioning MAF sensor will cause the computer to store a trouble code. So scan your computer for trouble codes. Also, you may test the sensor at home using a digital multimeter. Consult the vehicle repair manual for your particular make and model. Other symptoms: power loss, surging at idle, hesitation, stalling during acceleration and other drivability problems. A bad engine coolant temperature (ECT) sensor can also cause engine performance problems. ECT operation has an effect on the fuel system. 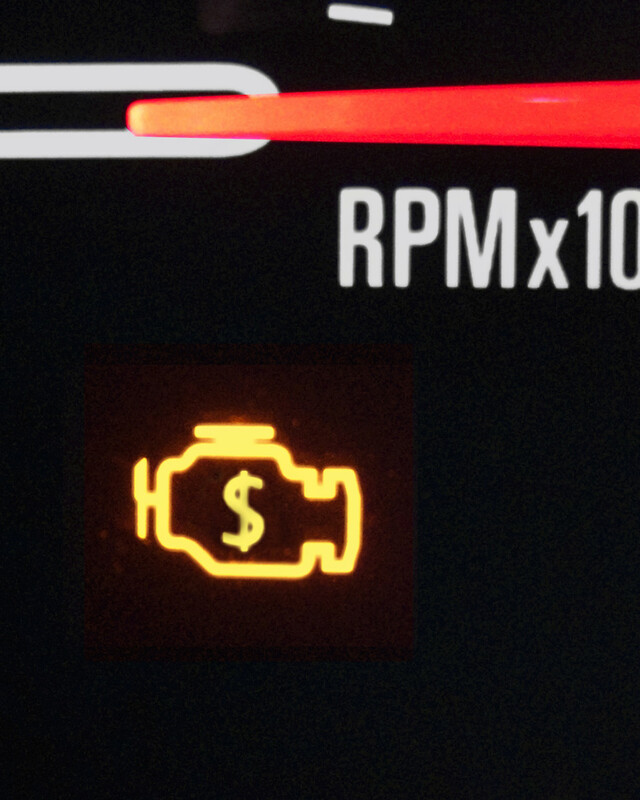 Your car computer uses this sensor's signal to lean or enrich the fuel mixture, depending on coolant temperature. An electrical open in the sensor circuit may cause the computer to lean the fuel mixture trying to compensate for conflicting signals from other sensors. 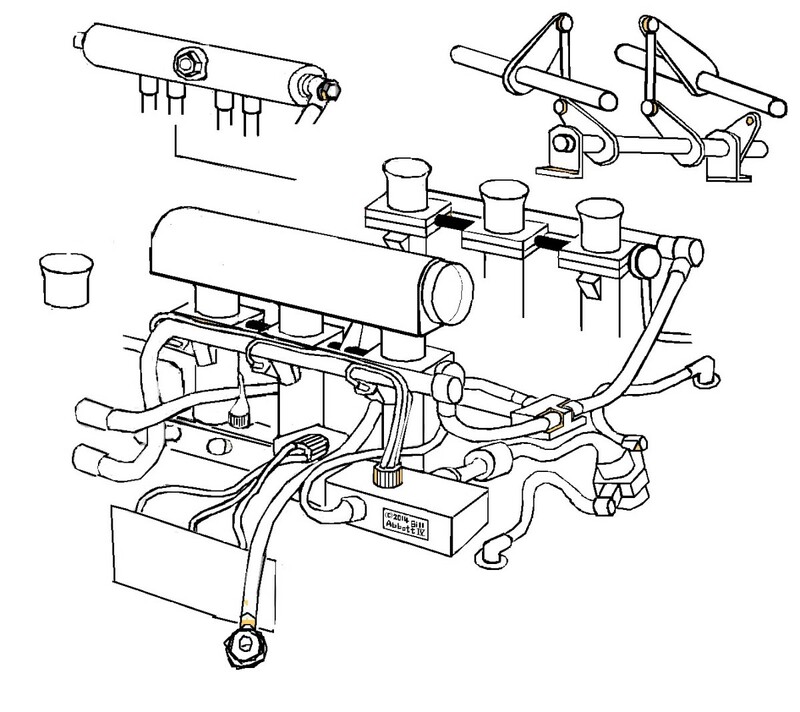 On some modern vehicles, a malfunctioning ECT sensor can upset ignition timing. You can test your engine ECT using this guide. Other symptoms: With a bad ECT, you may notice a continuous lean or rich mixture, an increase in emissions and fuel consumption, and engine stalling when cold; operation may smooth out once engine temperature increases. 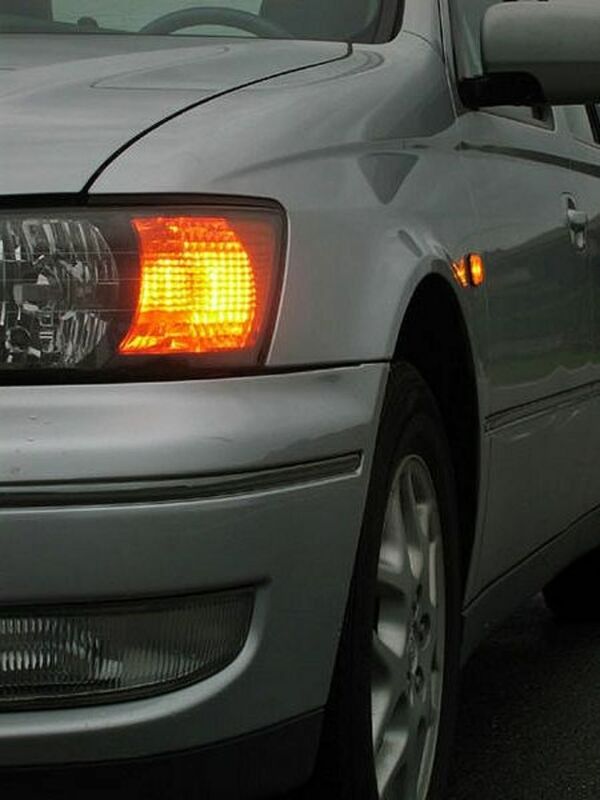 If a rough idle happens along with a flashing check engine light, you need to look into the problem as soon as possible. 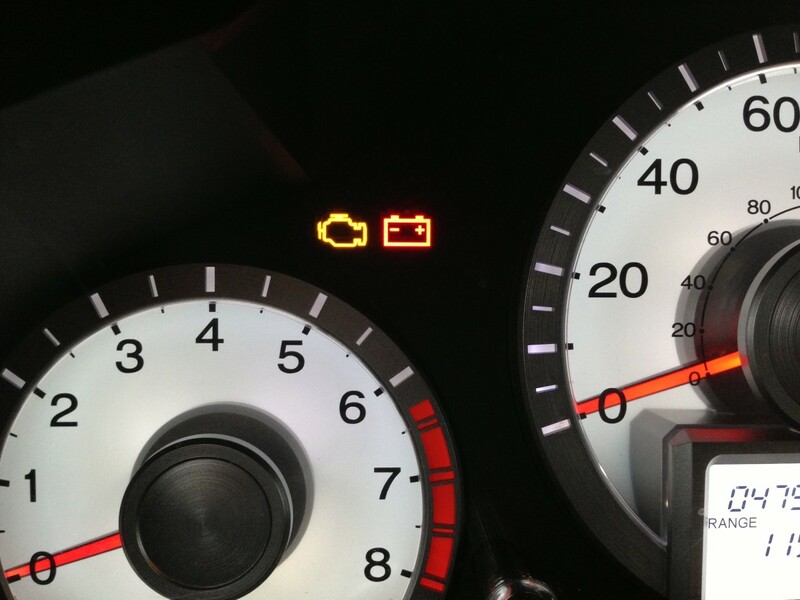 The flashing light indicates that a detected malfunction can cause severe damage to the catalytic converter. An expensive repair. This usually happens because the converter is receiving unburned fuel, and the fuel will gradually destroy it. The PCV valve allows your engine to move blow-by gases out of the crankcase by reintroducing them into the intake manifold to get reburn. Over time, the valve may fill with dirt and sludge, blocking blow-by gases, or simply the valve may stop working. Car manufacturers suggest servicing the valve at regular intervals to prevent sludge from blocking the valve and gradually destroying the engine. However, it is when the valve leaks when you may notice a constant lean air-fuel mixture with a consequent rough idle. Other symptoms: misfires, hard starts, and increase in oil consumption. 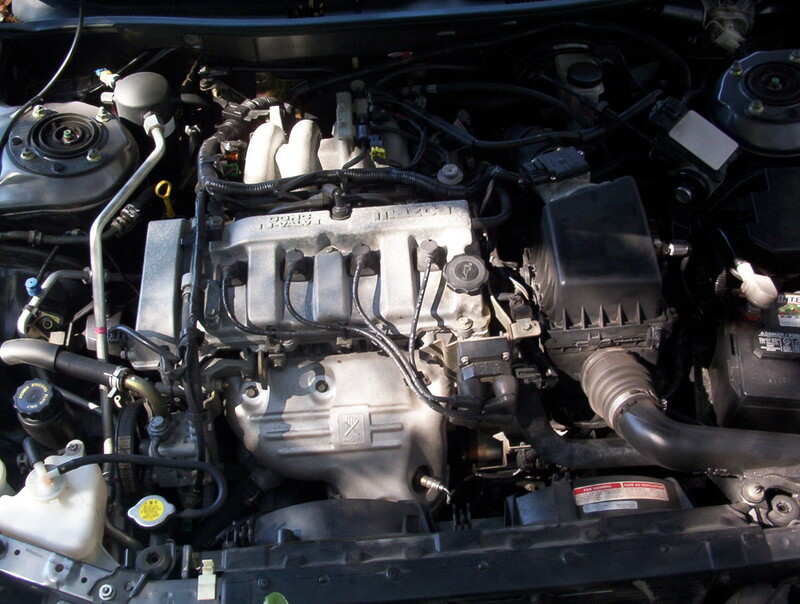 Besides regulating idle speed, the car computer uses the idle air control (IAC) valve to supply air to an engine with fuel injection system. It's not uncommon for buildup to block IAC valve passages over time, upsetting engine idle. Also, the valve itself may fail and cause similar symptoms. 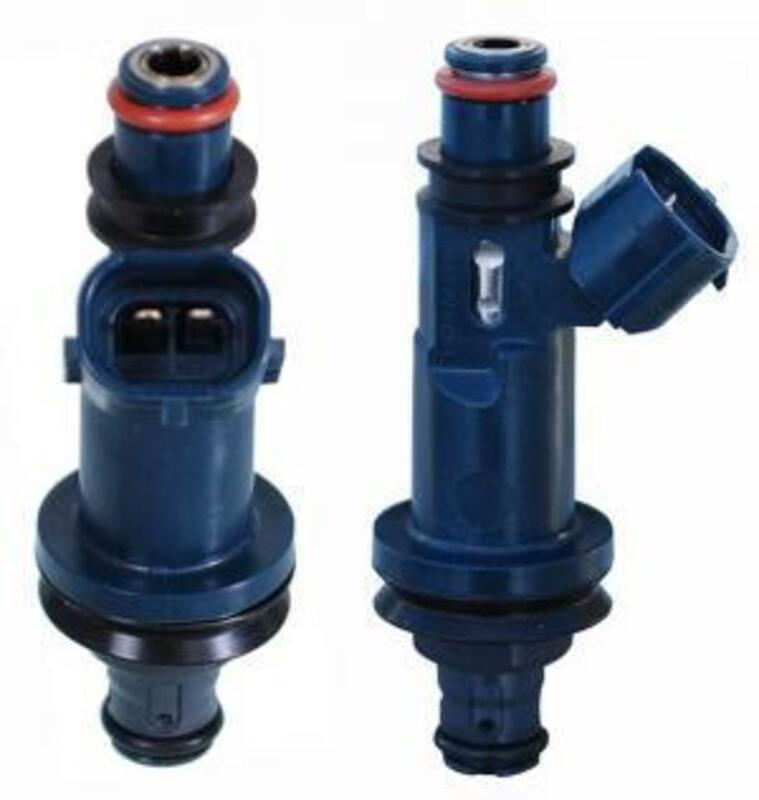 On most vehicle models with an IAC sensor, the valve is accessible and you can remove it to inspect air passages underneath. Consult your vehicle repair manual to test the valve using a digital multimeter. And watch the video below so that you have an idea how to clean valve ports and passages. Other symptoms: You may notice a constant idle speed, either high or low. The oxygen sensor measures the amount of oxygen in the exhaust gases. The sensor sends this measurement to the car computer as a voltage signal. Then, the computer uses this information to increase or decrease the amount of fuel delivered to the engine. Over time, the oxygen sensor (O2s) wears out or may become soiled with carbon buildup, causing the engine to idle rough. Usually, a failing O2 sensor will cause the computer to store a trouble code, but you still need to confirm that your oxygen sensor needs replacement. You may be able to test the oxygen sensor at home using a digital multimeter. Other symptoms: A bad oxygen sensor will reflect primarily in the fuel injection system or the computerized carburetor system of your car, resulting in a rich or lean fuel mixture, increase in fuel consumption, or misfires. The throttle position sensor (TPS) reports the opening angle of the throttle plate to the computer. For this, the TPS uses a voltage signal it sends to the computer. This simple circuit can also cause problems. If the TPS variable resistor wears out, or the circuit shorts out, it can cause the computer to enrich the fuel mixture; however, if the sensor's circuit opens, it'll cause the computer to lean the mixture with a consequent rough idle. Other symptoms: A bad TPS may also cause stumbling, hesitation, surging, stalling and a hard starting. These tips give you some extra help when the source of the rough idles seems hard to diagnose or after finding the source of the problem. For a better diagnostic, scan your computer for possible trouble codes, even if you don't see the light coming on. You may have some pending codes that can steer you in the right direction. If you, or your shop, recently did some work on your engine and soon after you noticed a rough idle, make sure you didn't leave something unplugged, a loose vacuum hose, or didn't properly reassemble the air cleaning assembly. Even a small air leak can cause engine performance problems. Idle speed is the speed at which the crankshaft rotates when the throttle plate or valve is closed or at rest. On modern vehicles, the computer controls idle speed, although a bad or failing sensor or mechanical malfunction can upset it. On older car models, though, adjusting idle speed is part of the tune-up procedure. Refer to your car repair manual for the procedure and engine rpm specifications at idle. Ignition timing (spark timing) means how early or late spark fires in relation to the position of the pistons in the cylinders. An engine slightly out of time can idle roughly since the spark is not in sync with the cylinders. Too much timing advance or retardation causes serious drivability problems. Many problems may upset timing. However, the most common is an overstretched timing belt or chain, or a bad tensioner after miles of operation. Check your vehicle repair manual for the service schedule, and how to check the timing belt or chain. And be warned that on interference engines, a broken belt or chain can cause severe engine damage as well. You may have replaced a bad component that was actually causing your engine to idle rough or erratically. But after installing the part, things didn't improve. However, some engines, specially modern ones, seem fussy about the type of parts you install. A poor quality component may not work as expected, and you may thing that you haven't found the source of the problem. So, save yourself some money and trouble. When replacing ignition components or some other electrical or electronic parts, try to use OE or a buy from a known quality brand. 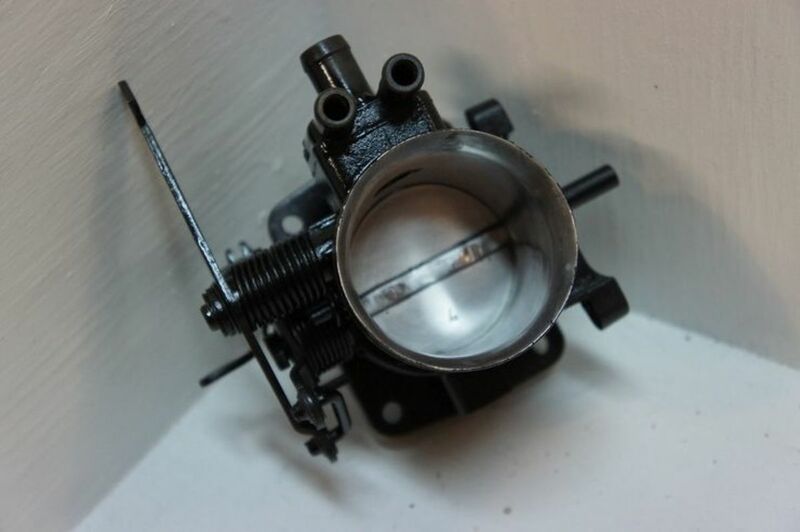 The throttle valve in the throttle body or carburetor connects to the accelerator pedal mechanically or, in some modern vehicles, electronically. This valve helps control engine power, speed and airflow. Over time, carbon buildup may grow around the engine valve and the horn--the walls inside the throttle were the valve seats--restricting or obstructing the operation of the valve, and cause an engine rough idle. You can check the throttle valve by removing the air cleaner intake on engines with carburetors or by disconnecting the air duct off the throttle body on modern vehicles. If the throttle walls or throttle plate is covered with buildup, spray carburetor cleaner on a shop rag and thoroughly clean the components. Other symptoms: Poor engine performance when cold or as it reaches operating temperature, hard starting, poor acceleration, rich fuel mixture at idle and stalling. Although you won't see this often, an engine rough idle can be a sign of problems with the fuel pump or fuel pressure regulator. A worn out fuel pump can fail to supply fuel at the adequate rate or with the correct volume to keep up with engine demand; also, the fuel pressure regulator can fail to hold pressure, causing too little fuel to reach the engine. Other components in the fuel system can also cause your engine to idle rough. 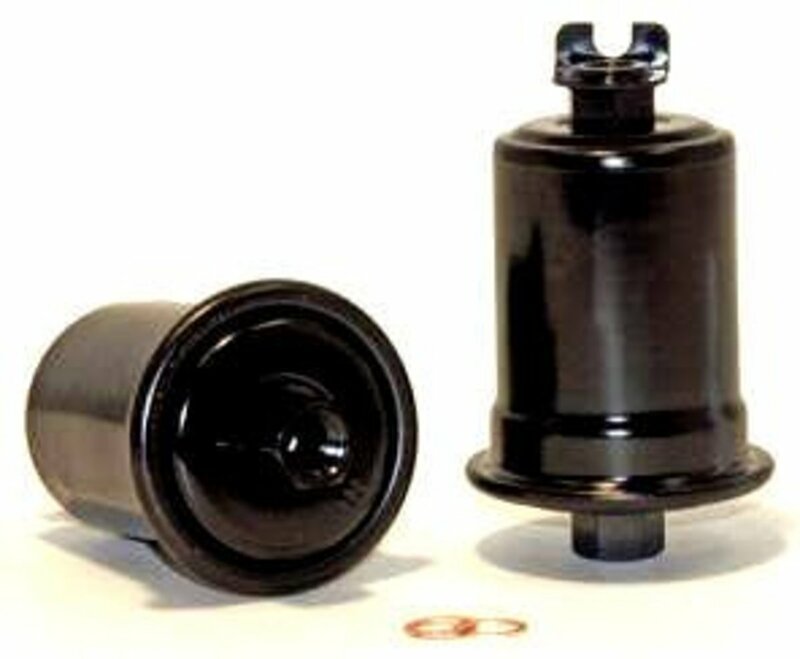 For example, a dirty (clogged) fuel filter, or an obstructed or bad fuel injector. On some models, the car computer can detect problems in the system and store trouble codes in memory that can guide you to the source of the problem. So scan your car computer, specially if the check engine light (CEL) has come on. You can use the repair manual for your car to make a quick check of the fuel pump and pressure regulator using a fuel pressure gauge. Other symptoms: Noisy fuel pump, hard starting, power loss at highway speeds, engine stalling after a few minutes of operation. The evaporative emissions control (EEC, sometimes EVAP or ECS) is another system in your vehicle that can cause rough idle problems. The EEC system routes fuel vapors inside the fuel tank into the engine for burning to prevent harmful emissions. Components in the system may consist of a purge solenoid, filler cap, relief valve, canister, purge valve, filter and hoses, depending on your particular vehicle make and model. System faults may cause the computer to store a trouble code. So scan your car computer, if necessary, and consult your repair manual to troubleshoot the system. Other symptoms: A fault in one or more components in the system may cause the engine to idle poorly, stall, leak fuel and increase pressure inside the fuel tank. 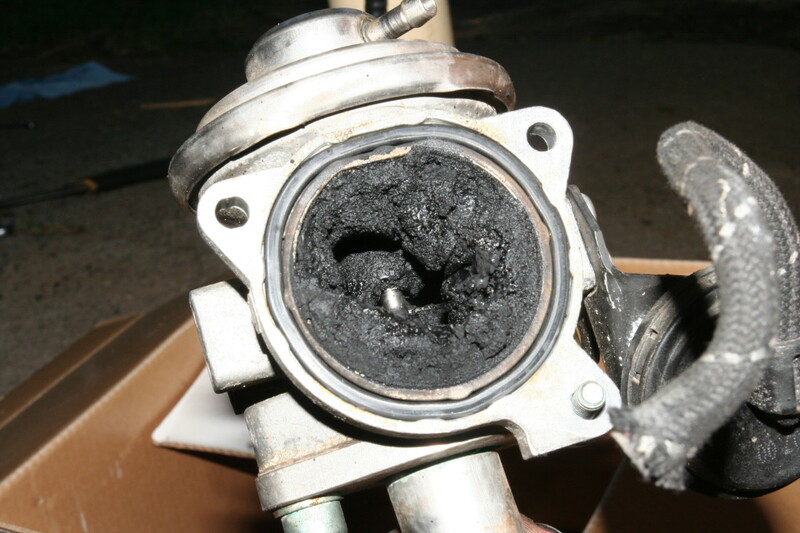 Vacuum leaks can cause your engine to idle rough. The leak may happen for a variety of reasons: You were working on your engine and inadvertently pulled loose a vacuum hose, or you forget to reconnect a hose; also, a hose may become brittle after miles of operation and crack, or a gasket may blow. First: check that all the vacuum hoses are properly connected at each end. Second: trace each hose with your fingers to feel for possible damage. Third: Set the parking brakes, start the engine and let it idle. Then, using a length of rubber hose, you can put one end of the hose against your ear and use the other end to probe vacuum hoses around the engine. Don't forget the hose between the charcoal canister purge valve and the intake manifold. Consult your vehicle repair manual to locate it, if necessary. Also, check the gaskets around the intake manifold and throttle body. You'll hear a noticeable hissing sound once you get close to the leak source. Make sure to keep away from moving parts. 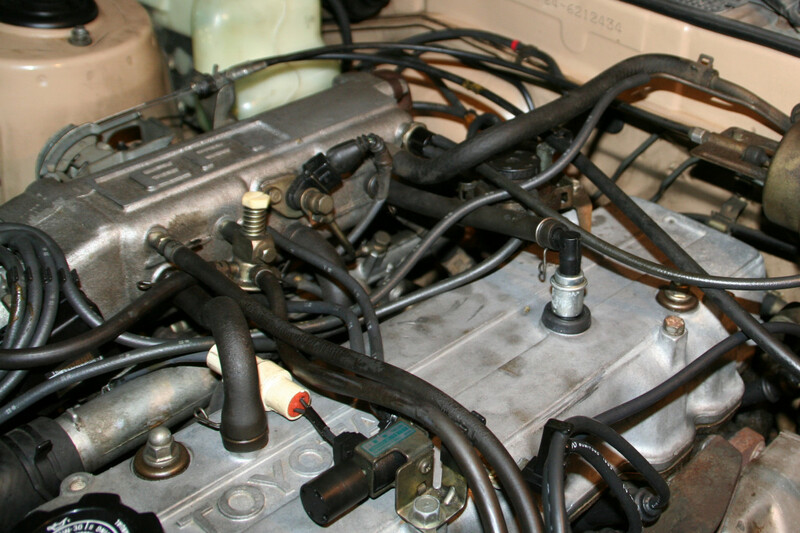 An alternative method is to use a solution of soapy water: Spray along the length of each vacuum hose, at connectors and fittings, and around the gasket of the intake manifold and throttle body. If you notice bubbles after spraying at a particular spot, suspect a leak. Other symptoms: Besides a rough idle, a vacuum leak may produce backfiring, hard starting, stumbling, high idle, hesitation, misfiring, poor power brake action, and poor acceleration. Although not as common, you may be dealing with a blown head gasket, a leaking or burned valve, or even a warped intake manifold. 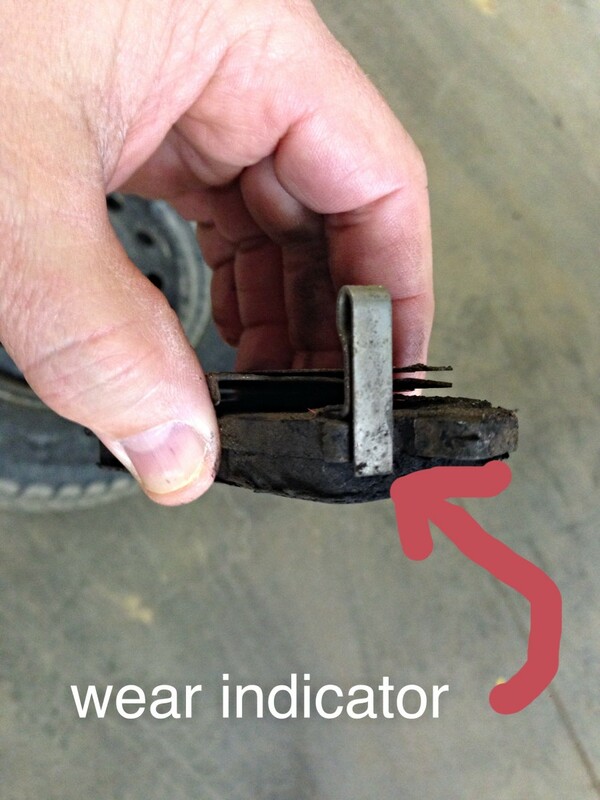 Usually, this type of problem shows up on a model with high mileage, or a grossly neglected engine. In either case, an idle problem from a blown head gasket usually shows up as a high rough idle. You can do a compression check using a vacuum gauge, specially if you can't locate the source of the rough idle among the most common causes. 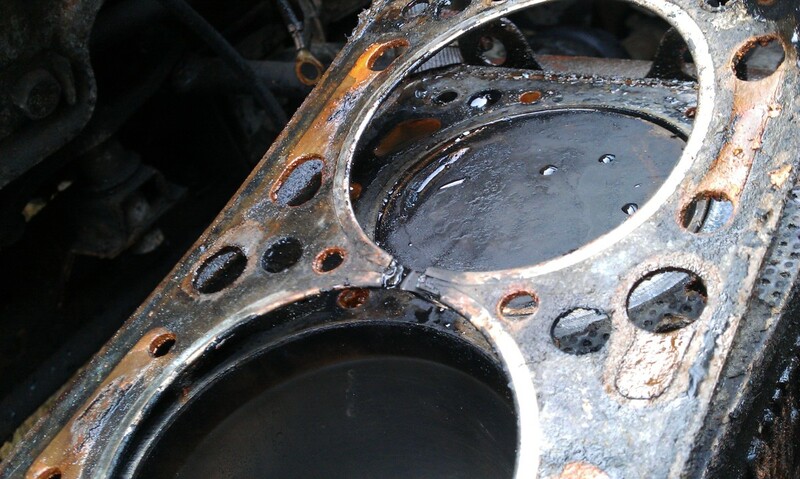 The test can not only diagnose a blown head gasket, but uncover the condition of piston rings and valve seats. Other symptoms: Missing, oil leakage, blue smoke, and overheating. Finding the cause of engine rough idle problems can be tricky at times, but paying attention to other symptoms besides the rough idle (shaking, noises, power loss) can help you close in on the source of the problem. And keep in mind that the most rough idles issues come from lack of proper maintenance. So check those components or systems you have neglected lately. And scan your computer for possible trouble codes, even if the check engine light is not on. But, whatever the cause, don't shrug off the problem, even if it seems to be a simple one, because it can result in a costly repair if you don't take care of it now. Would a faulty fuel temperature sensor cause a rough idle? When I press the accelerator, it quiets down. For reference, the sensor code is p1083. Why do my rpms run low and the engine shake while at a stand still running? 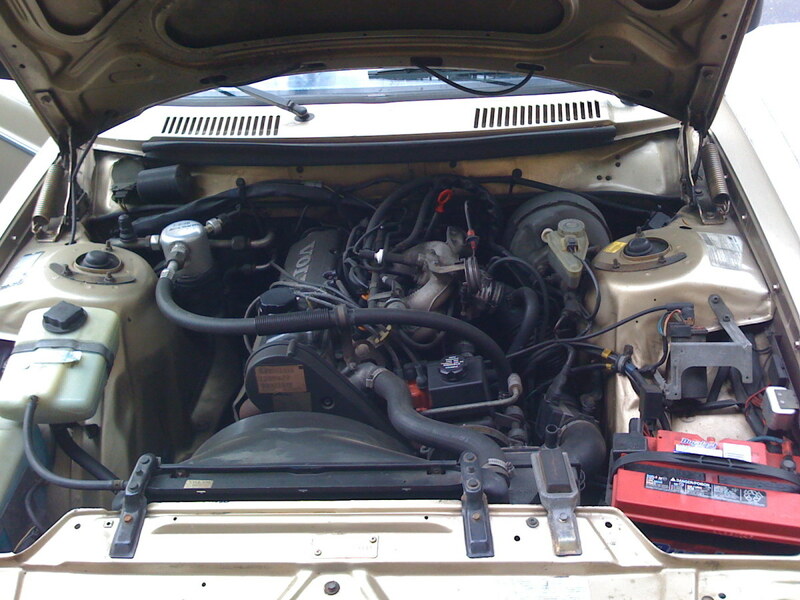 Pop the hood open and hear for any hissing sounds, check for a vacuum leak. You may need a piece of rubber hose to hear closely. Also, there may be a problem with the idle air control (IAC) valve-solenoid. You may need your vehicle repair manual to troubleshoot - it's not that difficult. A common issue with the IAC is carbon buildup. You may need to remove it to get a look underneath. Why would the ETS light be on in my S70 Volvo? It's possible that there's a problem with the ETM (electronic throttle module) - if the problem is the TPS (throttle position sensor), you might want to consider a contactless TPS. Some people seem to have good experience with this. Also, some models, including the S70, had a recall for the ETM, but I don't have the information. You might want to check with your dealer first before making any repairs. I have rough idle after I disconnected the battery. What would be the most likely cause? Double check and see if you didn't disconnect or left loose something else by accident, like a vacuum hose, cable or wire. 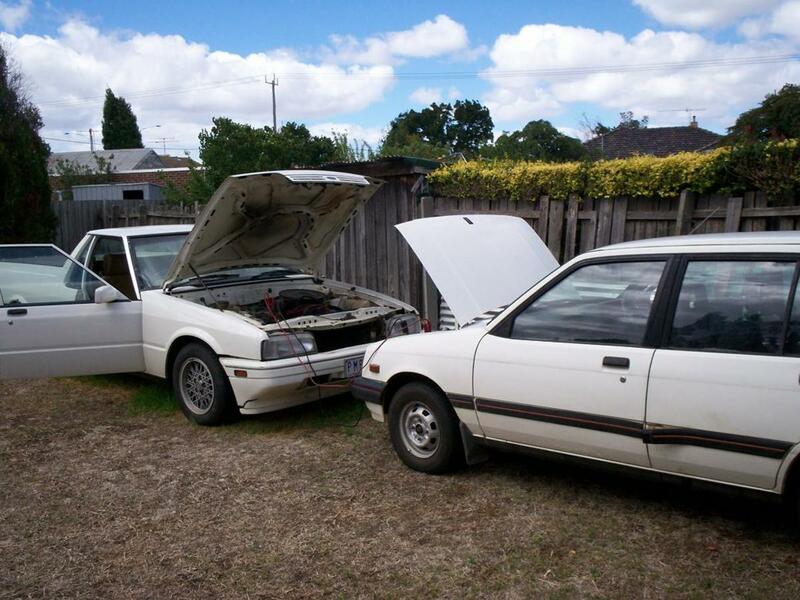 My 2001 Ford Laser just got a new timing belt and other parts. The mechanic said it has a cracked cylinder head. Funny thing is, it only made bubbles, no other stuff you mentioned like overheating and no coolant in the oil. It’s misfiring, idling weirdly, and the rev gauge goes up and down while in park. What could be wrong? The fact that there were bubbles in the coolant could possibly come from a cracked cylinder head, as your mechanic said. Overheating is usually the most common cause behind a cracked cylinder head, but hot spots created by air in the cooling system, and pre-ignition can also lead to engine mechanical problems and head gasket damage. If you need a second opinion, take your vehicle to a reputable shop for a diagnostic. I just changed my radiator and AC condenser. Now, when the car idles with the heater on, it begins to idle rougher. Would either of the two parts be faulty and cause this issue? The heater is an extra load the engine has to handle. There is extra power the engine is not handling well, perhaps a problem with the AC. But make sure you’ve changed spark plugs, ignition wires, and general maintenance items. My car has a random miss at idle. It fouls plugs every 30000kms or so. What should I try? Infrequent use of the vehicle, too many short trips, long periods of idle (as opposed to highway driving) can cause spark plugs to foul. Take highway drives for 15 to 20 minutes. Adjust the gap to specs using a wire feeler gauge. Check your owner’s manual, repair manual or the decal under the hood for the gap specs. Also, a leaking EGR valve, clogging fuel filter, worn fuel pump, a damaged vacuum hose, worn valves or guide, piston rings or cylinders can foul spark plugs. There are a number of sensors that may cause the engine hard to start when hot and may cause as well a rough idle. Sometimes it all depends on system maintenance. These may include a clogging air filter, vacuum leaks, air temperature sensor, throttle position sensor, idle air control solenoid, PCV valve, MAF sensor. Hope this helps. Thanks for the prompt reply. Look as I said this incident with the rough idle after some minutes of driving smooths out, progressively if that is important. Spark plugs and wires are new also the coil pack new. I have changed many parts of the car during time not all genuine though. Also sometimes after a short drive and park approximately between 5-30 minutes make it hard to start the engine, cranking but not starting especially during summer time when the car is very hot. I don't know if this is actually something combining with the rough idle. Take a look at the throttle body. Sometimes buildup around the bore and under the valve can cause this problem as well. Other possibilities are spark plugs and wires. Visually inspect the plugs, check the gaps, and service schedule. You can test the wires. resistance. Get the specs for these in your vehicle repair manual. I own a 2001 ford focus which have a rough idle (only when there is an extra electric load eg lights) but as you referring in your article it smooths out as the engine warms up. I already replace ECT sensor, fuel pump, alternator and others sensors battery is good but the problem insist. When you disconnected the battery, probably you erased the computer’s learned strategy from memory. This requires a relearn or reset procedure. Usually you can wait a few miles for the computer to relearn this strategy or you can do it manual (check your vehicle repair manual). I understand that you’d like to remove the EGR from the system(?). I wouldn’t recommend obviating the EGR, it may lead to overheating and increased emissions. The code suggests the computer is unable to compensate for a lean condition. It’ll be better to replace the broken connections and reset the computer, if any code reappears. Hope this helps. I have a 2007 twin turbo 2.3 Mazda CX 7. I recently replaced the spark plugs, cleaned the MAF as well as completely taking off the EGR and cleaned that, while attempting to unplug the small rubber line from the boost silenoid the plastic connection broke as well as the plastic one leading to the wastegate. I plugged the two broken connectors. Upon starting the car my engine light came on. Code scanner threw a P2187 code. I reset the PCM by disconnecting the neg. batt. terminal, and depressed the brake 5 times. The car idles rough but drivability is fine. It still idles sluggishly but nobengine light. The throttle body is pretty clean as well. Would it be feasible to delete the EGR completely? Any feedback will greatly help. If it is leaking fuel and affecting fuel pressure it can 'starve' the engine. So it's possible.